What is Maple Alley Inn? 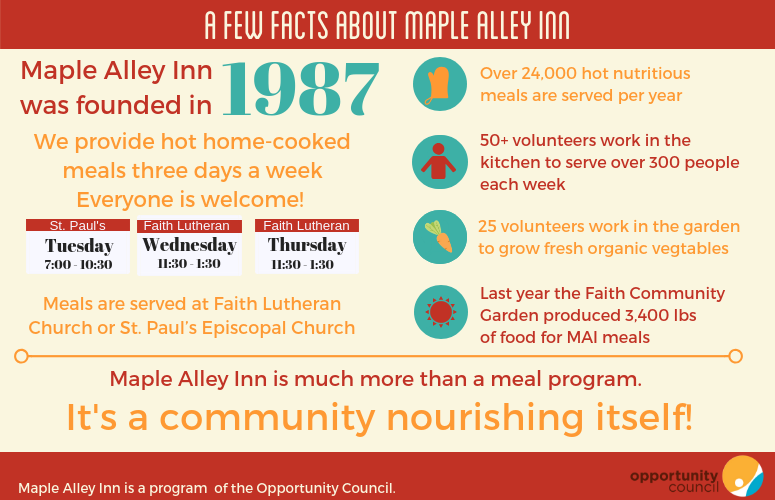 Maple Alley Inn serves healthy and sustaining meals in a comfortable and welcoming environment to Whatcom County residents experiencing hunger. Every week we serve breakfast on Tuesday morning and lunch on Wednesday and Thursday, focusing on nutritious high quality foods. A Maple Alley Inn community garden, grows organic vegetables that are a core part of the prepared meals. Where did Maple Alley get its name? This meal program started in an annex at the First Presbyterian Church on Garden Street. The alley between Maple and Laurel passed behind this annex and so that is why it was named Maple Alley Inn, a very cozy home-style name!